Check out the word ‘ages’ in the title. I should be gratefully aware of how old I am, no matter what. 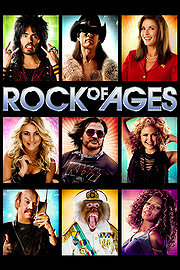 My all this time longing for old time songs, especially rock, was prime reason to pick this movie. Really, it’s hard to find any rock song nowadays. And besides, I kind of have a thing for musical movie. I didn’t realize this movie was quite musical (meaning: everyone sang almost all the time) before first fifteen minutes. Let’s just say so. But seemed like it’s one thing that made this movie enjoyable. I know, for youngster ears, those songs might sound a bit slow. The music was quite simple, the tunes, but I (and my husband) sang together with them joyfully. Those lyrics were extremely deep from heart, for us. How about the story? Julianne Hough and Diego Boneta were promising enough, at least they sang well. It’s rare to see young people adored rock songs so much, the way their characters (Sherry and Drew) did. I even though that Drew’s hairstyle and look was nostalgic, he fitted well in this 80’s musical theme (or maybe, 80-90’s). Yes, later he became [spoiler] a boyband member. That proved an accurate portrait, since boyband popped out again these days [/spoiler]. In fact, the casting director did a good job. This movie was made specially for people of my age, I think, since there’s subplot about strippers and the negative side of rock and roll. Women and church protesters, led by the major wife (Catherine Zeta-Jones) reminded me of Dark Places, where a young boy was blamed for loving this hard music and even considered “satanic”. Still, these points were not difficult to predict. Usually, listening to “recycled” songs made us sneer a bit and stubbornly stating that the classic versions were way better. Here, those were not bad at all. I couldn’t help giggling while Alec Baldwin sang Reo Speedwagon’s song, and tried to be fair to Tom Cruise. He had to have worked so hard, sang himself some songs. One of them, Bon Jovi’s Wanted Dead or Alive. If you miss classic rock songs, this one is worth watching.